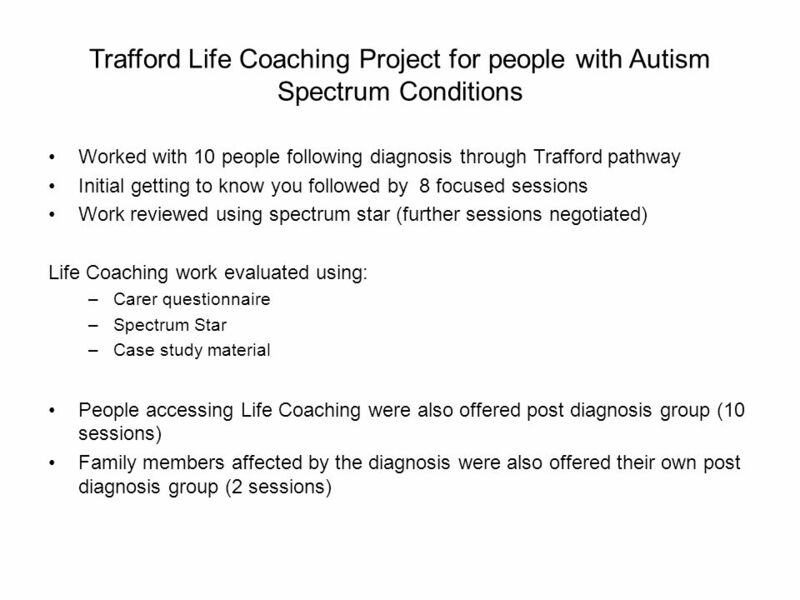 Trafford Life Coaching Project for People with Autism Spectrum Conditions. 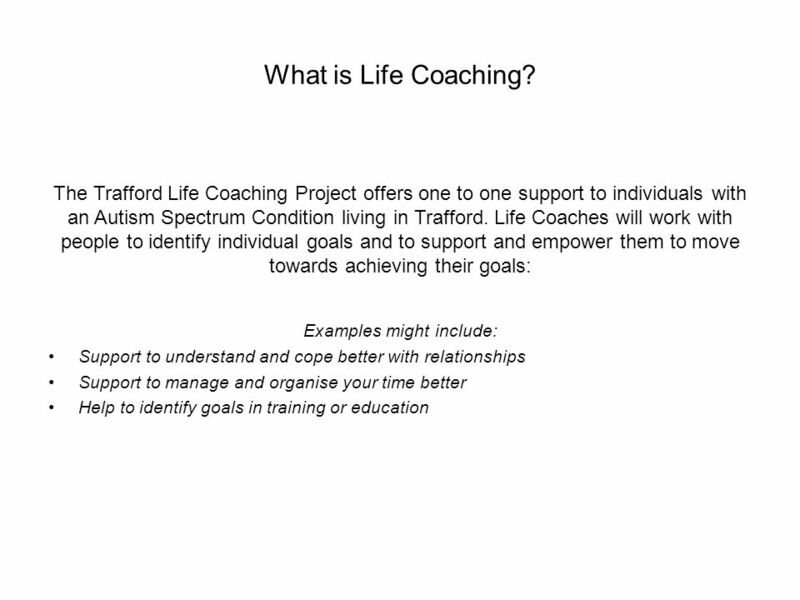 2 Why Life Coaching? 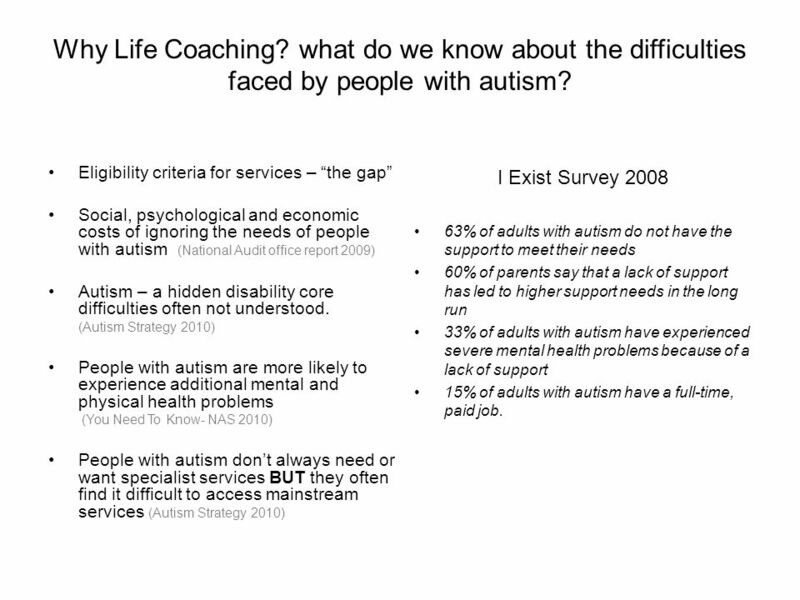 what do we know about the difficulties faced by people with autism? 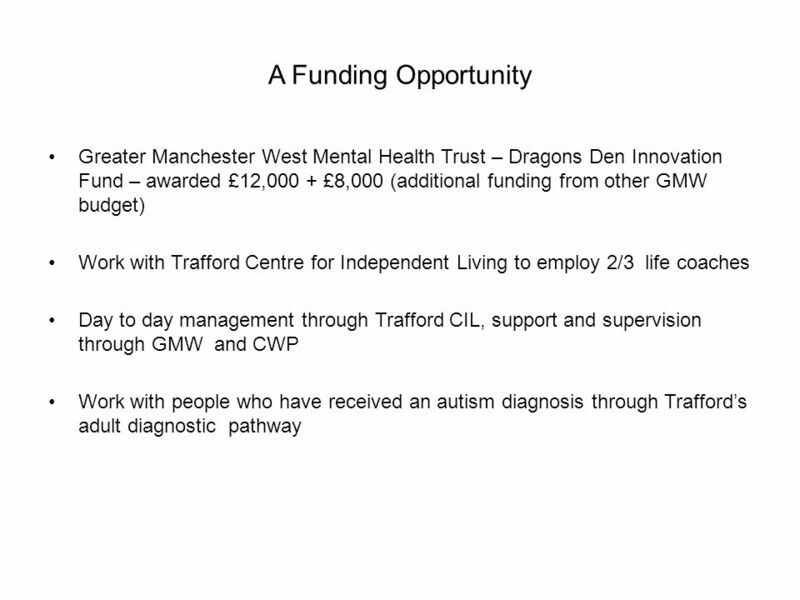 Eligibility criteria for services – “the gap” Social, psychological and economic costs of ignoring the needs of people with autism (National Audit office report 2009) Autism – a hidden disability core difficulties often not understood. (Autism Strategy 2010) People with autism are more likely to experience additional mental and physical health problems (You Need To Know- NAS 2010) People with autism don’t always need or want specialist services BUT they often find it difficult to access mainstream services (Autism Strategy 2010) I Exist Survey 2008 63% of adults with autism do not have the support to meet their needs 60% of parents say that a lack of support has led to higher support needs in the long run 33% of adults with autism have experienced severe mental health problems because of a lack of support 15% of adults with autism have a full-time, paid job. 7 Andrew’s story Andrew received a diagnosis of autism in his mid 30s. He works full time and has always lived with his parents who offer lots of day to day help. Andrew’s family are concerned about his vulnerability and his ability to look after himself without someone there to prompt and support. 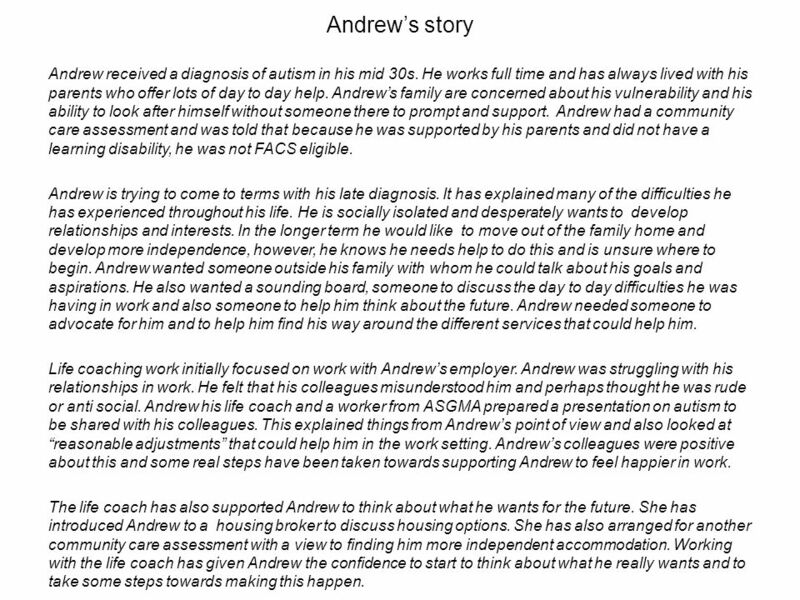 Andrew had a community care assessment and was told that because he was supported by his parents and did not have a learning disability, he was not FACS eligible. Andrew is trying to come to terms with his late diagnosis. It has explained many of the difficulties he has experienced throughout his life. He is socially isolated and desperately wants to develop relationships and interests. 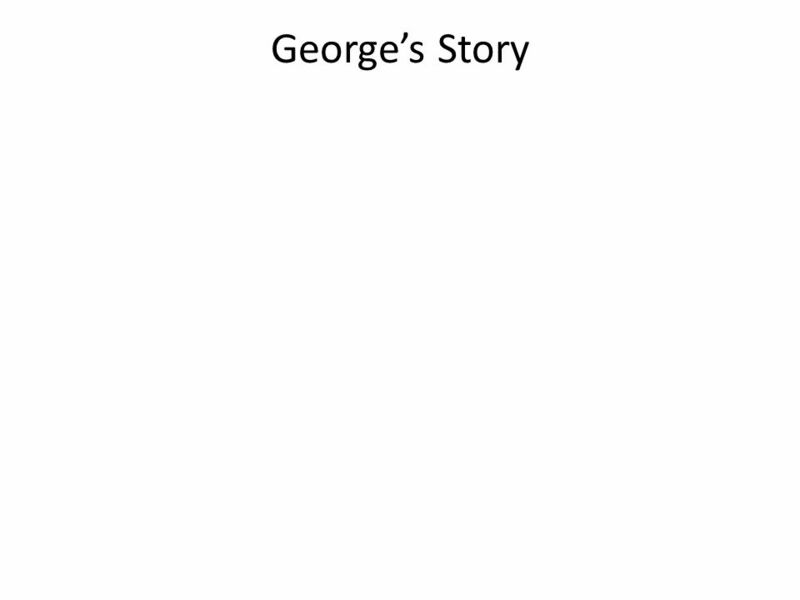 In the longer term he would like to move out of the family home and develop more independence, however, he knows he needs help to do this and is unsure where to begin. Andrew wanted someone outside his family with whom he could talk about his goals and aspirations. 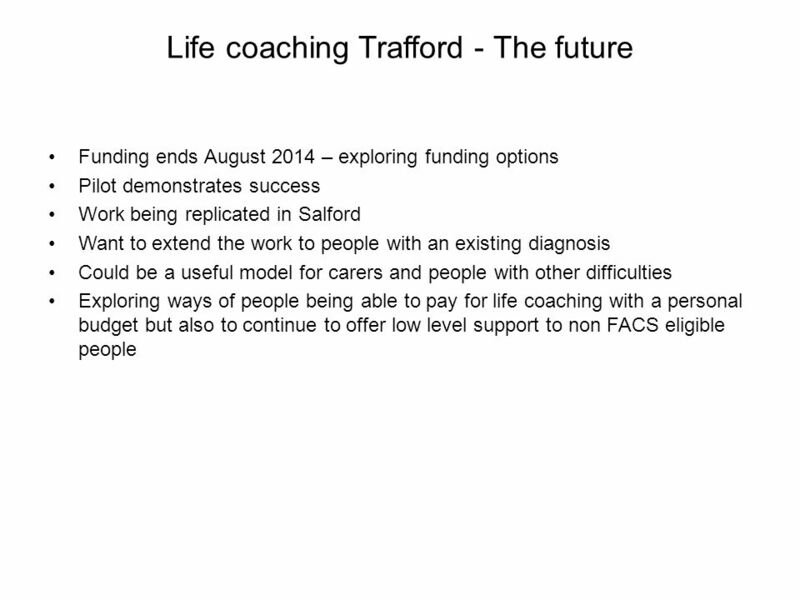 He also wanted a sounding board, someone to discuss the day to day difficulties he was having in work and also someone to help him think about the future. Andrew needed someone to advocate for him and to help him find his way around the different services that could help him. Life coaching work initially focused on work with Andrew’s employer. Andrew was struggling with his relationships in work. He felt that his colleagues misunderstood him and perhaps thought he was rude or anti social. Andrew his life coach and a worker from ASGMA prepared a presentation on autism to be shared with his colleagues. This explained things from Andrew’s point of view and also looked at “reasonable adjustments” that could help him in the work setting. Andrew’s colleagues were positive about this and some real steps have been taken towards supporting Andrew to feel happier in work. The life coach has also supported Andrew to think about what he wants for the future. She has introduced Andrew to a housing broker to discuss housing options. 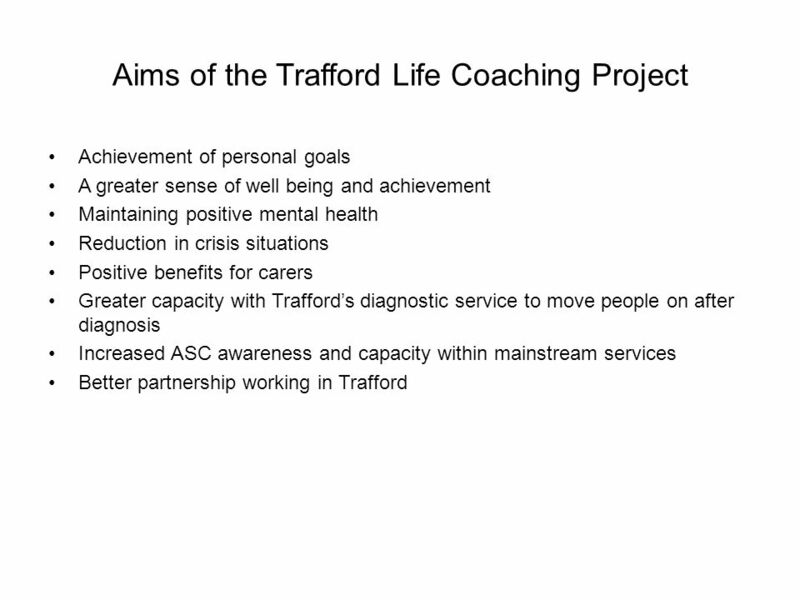 She has also arranged for another community care assessment with a view to finding him more independent accommodation. Working with the life coach has given Andrew the confidence to start to think about what he really wants and to take some steps towards making this happen. 8 Luke’s story Luke was diagnosed in his early 20s. He lives in a shared house with other young people. Luke has had problems in his accommodation, he has experienced bullying by housemates, and has found the stress of having to share his home very difficult. He has attempted to complain about this but the housing provider did not understand about autism and blamed Luke for the problems. Luke has had difficulties coming to terms with his identity following his diagnosis. He has a difficult relationship with his family, as some of them have refused to accept that he has autism. Luke has also had some bad experiences with his other relationships, and has felt rejected. This has led to feelings of depression and low self worth. Luke has attempted suicide on more than one occasion. Luke is struggling to cope with living independently he struggles to keep on top of day to day tasks. He has specific difficulties with numeracy and finds it difficult to manage his finances without support. He finds it difficult to engage with services and will often miss appointments. However, he referred himself to the Life Coaching Project and has consistently accepted the support offered. 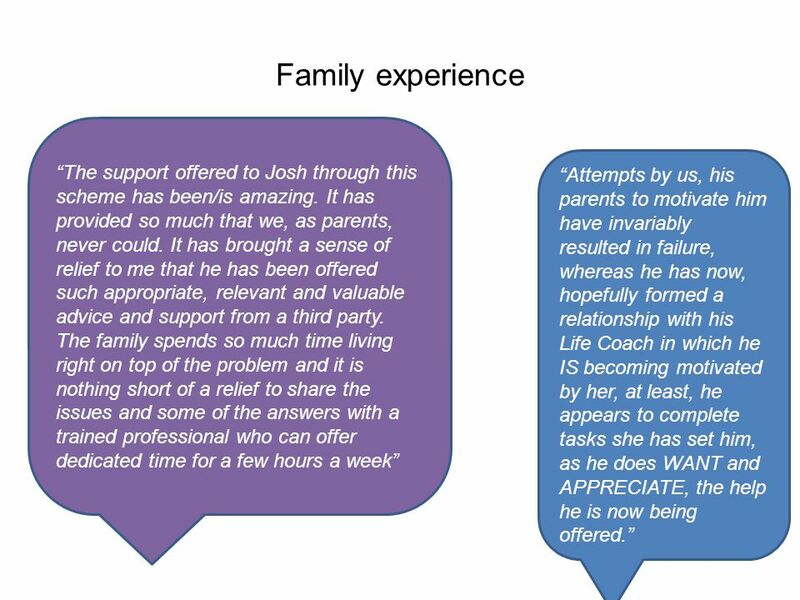 Life coaching working with Luke has focused on supporting him to understand his relationships, supporting him to develop systems for budgeting, understanding money, supporting him to tackle problems in his accommodation with landlord and co tenants. 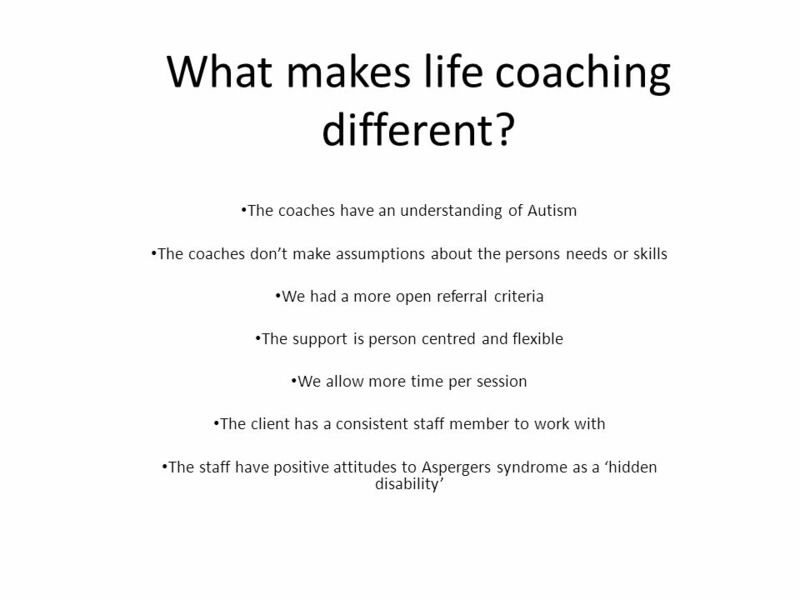 The life coach referred Luke to a counselling service and supported the counsellor to understand more about autism. She also referred Luke for a community care assessment, however, he was assessed as non FACS eligible. Like many people with autism Luke has poor insight into his own difficulties. He found it difficult to engage with the social care assessment process and to give a true picture of his day to day problems. 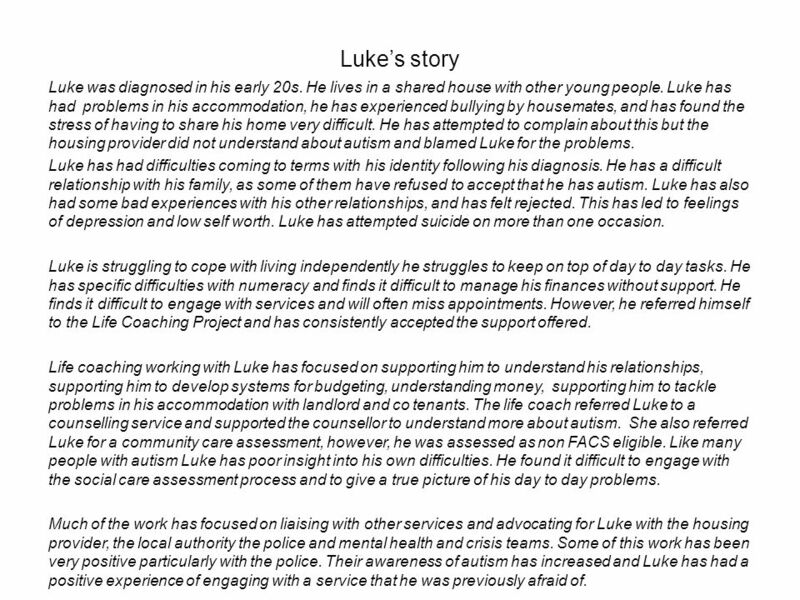 Much of the work has focused on liaising with other services and advocating for Luke with the housing provider, the local authority the police and mental health and crisis teams. Some of this work has been very positive particularly with the police. Their awareness of autism has increased and Luke has had a positive experience of engaging with a service that he was previously afraid of. 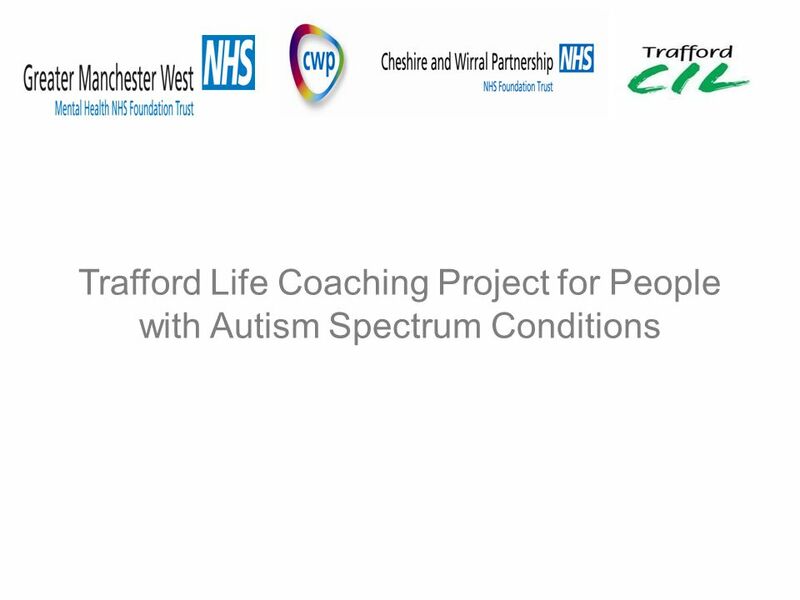 Download ppt "Trafford Life Coaching Project for People with Autism Spectrum Conditions." The Judicial Studies Board for Northern Ireland Induction Seminar 22 nd November 2007. Employability and Health -An Integrated Approach Stirling Council and Stirling CHP. Working with young people to discover their future Helena Bryce – Training Manager Calman Trust 2010. Coventry LA Womens Family Intervention Project Louison Ricketts Lead Senior Manager for FIP November 2011. Citizens Advice and EDF Energy Telephone Helpline Tailoring debt advice to the customers needs Ann Kinahan – Plymouth CAB. TRAIN TO GAIN AND THE THIRD SECTOR By Simon Forzani Employer Response Manager South London Learning Consortium. Information Session. “Knowledge is power… relevant knowledge is more power…relevant knowledge delivered by people who have been there and done that is. Self directed support and personal budgets: enabling risk, ensuring safety. Community Lives in Derbyshire Community Connector Service.